Steven Universe is just an average guy. He likes to cook for his friends. He has allergies. He’s very ticklish and he likes to play the ukulele. He’s awkward around his crush, Connie. Oh, and he’s also a half-Gem, half-human hybrid who might be the key to ending the conflict with the Gems on the homeworld and the rebel Gems. So… there’s that. Okay, so maybe Steven is a little out of the ordinary. Maybe he’s even a little weird, but that’s okay. In fact, being a little weird is far better than being just a plain old slice of ordinary! 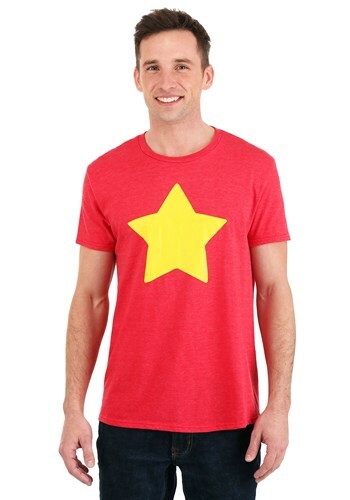 Now, it’s easy for you to be out of the ordinary when you cosplay as Steven in this Steven Universe costume t-shirt. This officially licensed costume shirt comes straight from the show! It’s made of a comfy cotton-polyester blend and a vibrant red color. It has Steven’s bright yellow star printed on the front, so all you need to do is slip this shirt on and you’ll be ready to join the Crystal Gems. Cosplaying as Steven is easy with this shirt. Just pair it up with a Cheeseburger Backpack, your ukulele, and an optimistic attitude, and you’ll be ready to hit up any convention.